The last few weeks of school got really crazy there for a bit. I was sick, we lost The Bug, grading was going nuts, I was still having meetings (even on the last non-final day of school! wtf! ), room decisions hadn't been made for next year and the other teachers were freaking out and I seemed to have plans for every single night. And, you all know how I find it impossible to cancel on anyone, no matter what. I was a bit overwhelmed. I got the opportunity to hang out all day with Ms.Can Do Kitchen herself on Thursday. We had breakfast at Broder (a Scandinavian place on Clinton). They had delicious breakfast. Mine was served on a tiny, square, cast iron skillet with a tiny potholder. Then we went to Mississippi and looked around. Meadow was awesome with salts, chocolates and flowers. They even had bitters. Ms.CDK bought some cardamom bitters, which should be fantastic in whiskey! We saw baby chicks at Pistil, too. We tried to head to Branch, but were too early. So, Pat let us chill with him at Cork for a while, telling us amusing stories and letting us sample some wine. I bought a very fancy beer for Mrpants and Ms.CDK bought some blond Lillet. Very fancy. We eventually got to head over to Branch, and had very yummy snacks and whiskey drinks. I loved the Dark & Stormy. Mm... gingery. Ms.CDK had an amazing mint julep in a tiny silver cup. A lovely day. On Satuday, the ladies met up at my place and we did about half of the FoPo Garden Tour. It was really fun seeing all of my neighbor's back yards and talking to them. I didn't have to be sneaky about trying to see their chickens and back yards. One woman had a lot of really cool flowers, and one she didn't care for: The infamous Corpse Lily. It's really big (4' tall and the lilly was larger than two hands put together), and when it blooms it smells like rotting meat. Madness. After the tour, most of the ladies went their separate ways. Nerdygirl and I went downtown to Powell's to the Regretsy book signing. The author was very funny, although she mentioned that when she pitched her idea of a crafting version of antique road show to Comedy Central, they not only passed on the idea... but they told her since Sarah Silverman's show wasn't doing too well, "We aren't working with women right now." WTF? Her response, "Well, we both have warm blood, too. Perhaps you should stop working with all mammals." What the crap? Sarah Silverman represents all women now? Comedy Central, you're full of crap. Anyhow... we left the book signing, had lunch at Rogue and then went to explore Vino Vixens on Powell. I swear VV uses time-lord technology. They are way bigger on the inside than you expect. There were six rooms inside a place that I thought would be able to hold six people. Very unexpected. We ended the night at Kennedy School with pizza, beer and Hot Tub Time Machine. As Nerdygirl said, "It's nice to a see a new 80's movie with John Cusack." Go see it. This was an awesome way to start Summer. And shortly, I'll be leaving for three weeks of London (and a weekend in Copenhagen). I love this plan. We lost the Bug yesterday. He was 15. I will miss him terribly. He was with me since I was 19, and moved through 10 different houses and apartments, including one log cabin. He was full of spite, tried to bite everyone, wanted to dominate the world, and I loved him. I'm heart-broken. RIP tiny Bug. Stop motion projects are finishing up. I have three more on the way, but I thought I'd post the first I received. They're not super polished, but we were doing this as more of an experiment. Wheee! 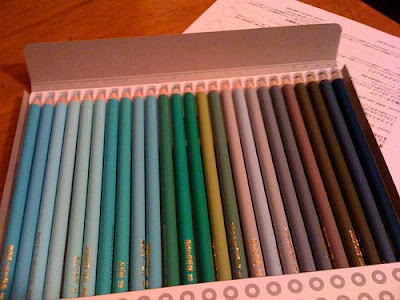 I received the first monthly shipment of my 500-count colored pencil set that mrpants got me for the holidays. It's so freakin' cool! cyan, indian princess, pastel turquoise, east of eden, green puff, summer sea, bluegreen velvet, celtics, bobby shaftoe (!!! ), rivulet, garden club, parrot, snow pea, sister susan, california passion, drizzly afternoon, glacial lake, zuni stone, porcelain blue, hawthorne valley, red-tailed cat, dugong, spring green, deep aquamarine, prussian blue. Two things... first off, I've had to turn on comment moderation as I received a bunch of Chinese spam this morning at around 5am. So, comments will be a little slower to appear. Secondly, I'm going to yoga this morning. The wee little yoga place has a wee little woman who plays a harmonium during her ohm chanting. It's kinda odd and funny, and I like it. 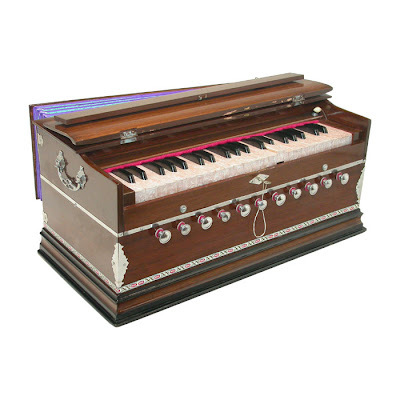 Who doesn't like a harmonium? Thirdly (I lied, there's three things), we're having a tree from Friends of Trees planted today in our parking strip. January seems like a cold, cold time to do tree planting to me, but that's the date we received. We bought a Flame Leaf Maple. Should be pretty. Wish me luck on learning Flash on Sunday. El Chucabra offered to help and is coming over. Is this not the coolest? 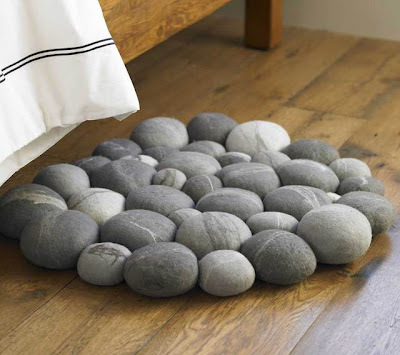 It's felted merino wool, in the shape of river stones, made into a funny little rug. I love it. It's crazy-town expensive, but awesome none-the-less. I haven't posted in a while. Things have been busy. Yesterday was the last day of the term, so I had a kazillion things to grade and final grades to post. I also presented at the semester awards for the art department. I didn't want to go back over to the 'Couv at 6pm, but listening to the stories about the kids that were nominated was pretty rad. There are some amazing individuals at our school. The whole scene left me feeling pretty good last night. Which was nice, 'cause today didn't go quite as well. I had to convince one kid that the advanced level class was not the right place for him (he cried.). I had to send three kids away because they flunked level one (one cried). I did my annual review process with my yearbook kids (two cried), and had one girl drop yearbook. sigh... Now I have a headache. Also, I'm worried. My first period room got switched, and we won't have the animation program installed for at least two weeks. I'm not sure what I'm going to do with kids. I have 27 boys in a room at 7:45am for an hour, and no way to start them on animation stuff. I'm debating between starting a group project stop motion lesson or a single person flash animation lesson. I don't know how to do either... so I'd be learning on the fly, and probably staying late at school for the next few weeks. How hard can flash be, right? I just finished reading a book today. I started and finished it today, which happens when I have no other obligations in a day. 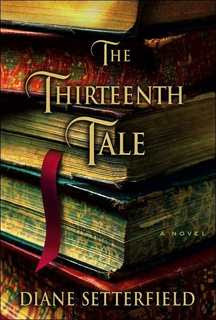 I can devour a book in one sitting. I can understand, body and soul, when an author describes "surfacing from a book." There were two particular paragraphs in this book that really struck me. After reading one of them, I had to stop for a moment. It made me tear up a little. It also made me text a friend who is also terribly fond of books. "I have always been a reader; I have read at every stage of my life, and there has never been a time when reading was not my greatest joy. And yet I cannot pretend that the reading I have done in my adult years matches in its impact on my soul the reading I did as a child. I still believe in stories. I still forget myself when I am in the middle of a good book. Yet it is not the same. Books are, for me, it must be said, the most important thing; what I cannot forget is that there was a time when they were at once more banal and more essential than that. When I was a child, books were everything." This is a Flickr badge showing public photos and videos from clumsiegirl. Make your own badge here. teacher, artist, knitter, craftster, cat owner, gardener, art lover, brew assistant, sister, daughter, aunt and friend.